Examines the implications and meanings of the makeover and aesthetic surgery industry in American popular culture. Feminist theorists have often argued that aesthetic surgeries and body makeovers dehumanize and disempower women patients, whose efforts at self-improvement lead to their objectification. Amending the Abject Body proposes that although objectification is an important element in this phenomenon, the explosive growth of "makeover culture" can be understood as a process of both abjection (ridding ourselves of the unwanted) and identification (joining the community of what Julia Kristeva calls "clean and proper bodies"). 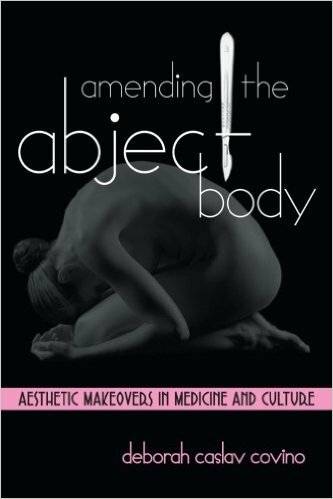 Drawing from the advertisement and advocacy of body makeovers on television, in aesthetic surgery trade books, and in the print and Web-based marketing of face lifts, tummy tucks, and Botox injections, Deborah Caslav Covino articulates the relationship among objectification, abjection, and identification, and offers a fuller understanding of contemporary beauty-desire.